"Now!" yelled the Wabbit and Skratch the Cat tilted the tray. Torrents of Spam shot from the sandwiches and leapt on the Gnamskulls. More Spam waved gracefully in the air and wafted around looking for targets. There was nothing the Gnamskulls could do. They were hopelessly addicted to Spam and their intakes filled with meaty advertising. The portico echoed to the sound of grumbling, rumbling and crashing as Gnamskulls listed, swayed then fell helplessly to the sidewalk. Skratch watched with satisfaction. "Wabbit, what if there's Spam Creatures left over?" he asked. "I calculated it carefully," said the Wabbit. Skatch looked dubious about the Wabbit's calculations but the Wabbit grinned. "I have a back up plan." He looked up at the portico roof and Skratch followed the direction of his gaze. Curled in windows, Marshall Duetta Spyder and two of her Red Spider cohorts lay quietly in wait. They showed little anxiety over the melee below and cheerfully waved a squiggly wave. 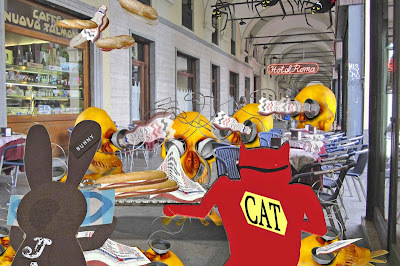 The Wabbit waved back and watched the Gnamskulls and the Spam - and counted. "OK Skratch, the Gnamskulls are down." "Any Spam left over?" said Skratch. 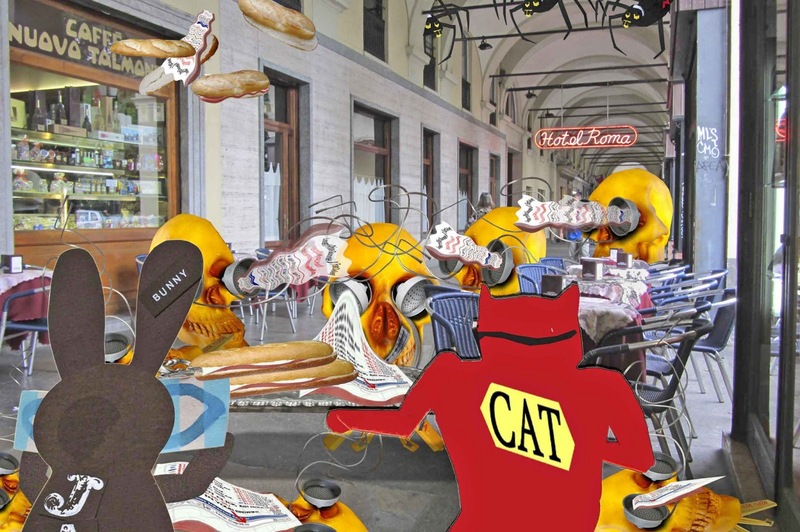 The Wabbit made another sign to Marshall Duetta Spyder, then turned to Skratch. "It's not over until the Big Spider spins."